6 men, until Sterling ran us down, took on the hills of the Precinct AO for about 5 miles. It was great running weather and the pace reflected it. We covered the planned route which included the segments: Fairlea Hill (twice), Farmlands, and Katelyn Dr. Climb….and had time for extra credit….down and up the hills on Saxonbury and Reddington. Blip…you have improved a lot Man! Impressed. Two-Step….welcome back from Ghana, hope your leg tweak is minor. Skipper…strong running, you will have fun at SMR. Trail Mix….shirtless and steady. Sterling….you have come a long ways and look like a runner. 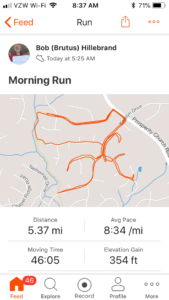 Skull Candy….strong run after being sick. I was impressed with the kick down Katelyn toward the pool, where you thought the end of the cruise was….and loved your scream of anguish when I told you we were doing extra credit and a few more hills. COT prayers of praise for God’s work in Blip’s education and recent test, improved health in us and our families, and Two-Step’s and Hotwheel’s mission trip and safe return. Great cruise this morning…and SMR training.